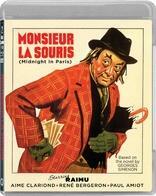 Monsieur La Souris (aka Midnight in Paris) is a 1942 rendition of the detective story by French novelist Georges Simenon that stars Raimu, one of France's most celebrated stage actors. Raimu portrays a tramp, Monsieur La Souris (with the nickname of "Mouse"), who earns a meager living as a porter at a cabaret in Paris. Mouse is thrust into the midst of a murder mystery and his life becomes a "whodunit" with a thrilling twist a la Agatha Christi that he is compelled to solve. The drama unfolds one night when he opens a customer's car door and finds its driver dead. He runs to tell the doorman, but when he returns, the car is leaving. A wallet falls from the door which contains several hundred thousand francs, an old envelope with an address, and the owner's name - a well-known financier and stamp collector. Mouse is obsessed with carrying out his own investigation, but Inspector Lognon (René Bergeron) and Commissioner Lucas (Paul Amiot) are on the case and intrigued by Monsieur La Souris' behavior. They wonder if he or the relatives of the victim are implicated in some way and he becomes a suspect in the murder enquiry. This film is propelled by Raimu's huge talent and his final (very long) lines are priceless and worth the price of admission alone. 1. Bonus Featurette: "The French Detective"
CINETROVE INTERNATIONAL is dedicated to introducing outstanding overlooked foreign classics to home video.